Blame the network? Sure, but what about cosmic rays? Play the IT Blame Game at www.itblame.com. "I think the greatest measure of a good network engineer is to have the ability to demonstrate and prove to non-networking teams the reasons why the network is not to blame (and to take the flak when it is)," wrote one engineer on a networking forum. "It's a fact of life that people will look to the network first at the first sign of trouble." You can avoid the IT Blame Game with Network-Based Application Performance Management. Network engineers understand better than anyone the need for objective facts when troubleshooting application performance issues. Packet analysis provides these facts, but tools like Wireshark require a significant level of expertise. Similarly, database administrators have niche tools they rely on. IT professionals supporting storage and virtualization also have monitoring and troubleshooting tools to cover their respective technology silos. The ExtraHop system would make these guys' lives a lot easier! Despite these efforts, it's nearly impossible to solve the IT Blame Game when teams are using various tools to troubleshoot application performance problems. The fact that the ExtraHop Application Delivery Assurance system is accessible by everyone in the IT organization is often one of the primary reasons customers purchase it. "Depending on whether they are database administrators, network administrators, applications specialists or help desk professionals, different departments within IT persist in their use of their own purchased and custom-developed tools and diagnostics. When an application problem in production develops and no one is sure what is wrong, each of these departments retreats into its own tools and diagnostics to see if the issue is in its area. All too often, the various parties meet in a 'war room' setting and end up pointing fingers at each other, saying that their area of the troubleshooting is clean." Performance optimization within the context of an entire end-to-end transaction or process"
The ExtraHop system meets these requirements cost effectively and efficiently with a network-based approach to application performance management. The entire premise of this approach is that the health and performance information needed to manage application performance is on the wire. Although other monitoring tools also take a network-based view, only the ExtraHop system performs full-stream reassembly. The ExtraHop system reconstructs traffic flows to analyze the payload from L2 to L7. Not to mention, it is purpose-built for production enterprise environments, handling up to a sustained 10Gbps and supporting real-world traffic patterns such as IP fragments, out-of-order segments, and microbursts. So, how does the ExtraHop system solve the blame game? Many of our customers—including network engineers, database administrators, and application support personnel—look at the ExtraHop system first when a problem occurs. With the ExtraHop system, they can see real-time application performance and quickly correlate application behavior across tiers, including network, web, database, and storage. They can drill down into problem areas to see the application-level details, such as specific error messages or methods used. This level of detail not only pinpoints the root cause of the problem but also provides the responsible team sufficient information to remediate it quickly. Call it fact-based, cross-functional troubleshooting—just the right remedy for solving the blame game. Need more convincing? 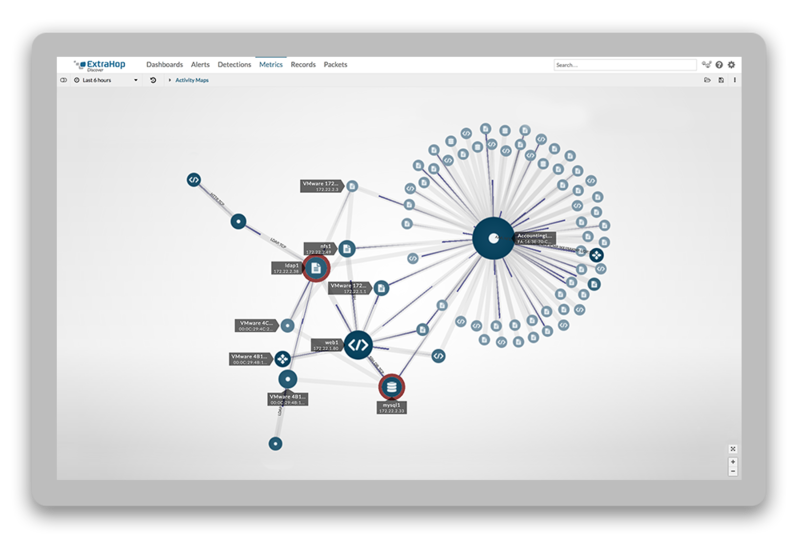 Check out our online demo or upload a packet capture to NetworkTimeout.com, our free web-based packet analysis tool, to get a sense of the level of visibility possible with the ExtraHop system. 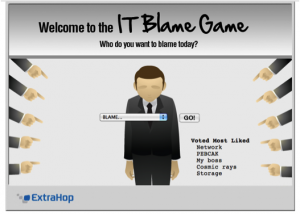 In the meantime, if you're looking for a good excuse for performance problems, play the IT Blame Game at www.itblame.com.